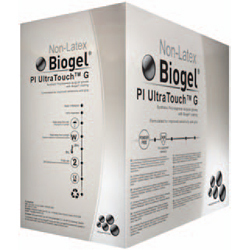 On March 2010, Molnlycke Health Care announced the addition of two polyisoprene surgical gloves to their line up: Biogel PI UltraTouch G and Biogel PI Ultratouch M. In contrast to its predecessor, the Biogel PI, the new Biogel PI Ultratouch gloves are 15% thinner. Ultimately, this results in a better feeling surgical glove with great tactile sensitivity. The Biogel PI UltraTouch G is shaped with the fingers being curved. This option gives surgeons and nurses the flexibility of maximizing their comfort of wearing surgical gloves depending on the procedure performed. For enhanced grip, this surgical glove also has a micro-roughened surface. Molnlycke recommends the Biogel PI UltraTouch G glove for general surgery including microvascular, plastic, and cardiothoracic surgical procedures. Just like the rest of Molnlycke’s Biogel gloves, every PI Ultratouch G surgical glove is air inflation tested boasting an industry-leading 0.65 AQL of holes.